Enlightened Maniac gives you two bodies, one of which is a 3/2 token, which is about on par with the other tokens your deck currently makes, and gives you a body you can throw in front of attackers since you don't have to care if the maniac dies. Sublime Archangel is a real powerhouse and can turn one attacker into a larger presence guaranteed to get through for damage. 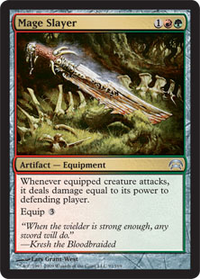 Silverblade Paladin gives you the opportunity to get extra damage on whatever token you target with Temmet's ability. Lastly, while a slower card, Titan Forge can be a real threat, especially when combined with Silverblade Paladin as the golem you get will be able to hit someone for 20 damage. ticked-off-squirrel on should i upgrade? i'm ordering cards off of Amazon for my Daretti's Goblin Factory and i am trying to decide if i should upgrade my Hammer of Purphoros to Titan Forge. You could also try Titan Forge? Was and old dumb card i use to play in standard same with Conversion Chamber and Surge Node not sure if you would be interested? Also yeah sorry did not notice/understand what 2DH meant or read the description lol. But for the Plague Myr I always find 2 mana ramp in a colour that has a tough time ramping is always a welcome inclusion, but thats just my thoughts. Maybe even add Fellwar Stone, Fire Diamond, Shrine of Burning Rage (trust me its a threat) and Treasonous Ogre if you wanna try different ramp. BTW that Chaos Moon is a sick card ive never even heard of! I see you have Lux Cannon in the maybe-board. If that direction interests you as an alternate plan, there's a few related cards that make a fun combo plan. You run Contagion Engine, Inexorable Tide and Winding Constrictor as proliferators (you already have 2/3 in main. Lux Cannon can then destroy all permanents. 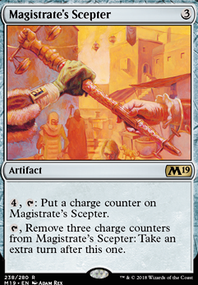 Magistrate's Scepter can also frequently go infinite without the sage/cornucopia combo (although it takes 2 turns to set up without at least sages to untap it). 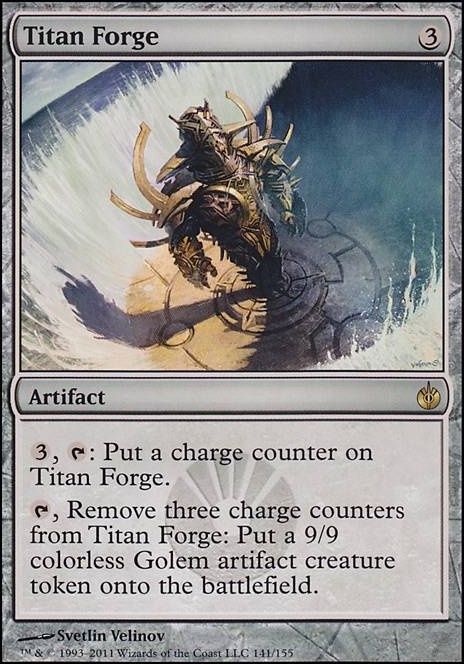 Titan Forge is another potentially fun card in that general plan. One of the things I like about that plan is that all of the pieces are pretty good even if you only have 1 or 2 of them. If you happen to be able to get enough pieces (with say something like Liliana Vess or Ring of Three Wishes, you just win on the spot. A big ol' +1 for the wonderful theme deck! Always been a fan of Moonfolk. To better search up those essential artifacts, Trophy Mage will help her Trinket and Treasure brothers. She will get you your precious, precious Heartstone and another helpful card I'll suggest later. 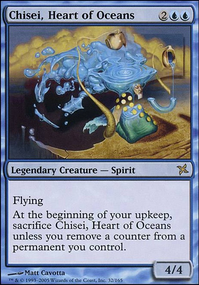 Tutoring for creatures will be a pain in blue no matter what, so rely on card draw as much as you can. I'd move away from big, single-use draw spells like Blue Sun's Zenith and instead focus on ability-based effects. You've got a fair number of Moonfolk Wizards; maybe Azami, Lady of Scrolls can be of service. When you're rockin' a deck as powerful as Moonfolk tribal, people start to get jelly. And when people be jelly, they blow up your stuff. But there's a Vedalken that can help protect your colorless stuff: Padeem, Consul of Innovation. For your creatures...I can't believe I'm about to suggest this... try Tortoise Formation. And when you're done laughing at my poor judgement, the best thing blue can do to prevent destruction is counter, so invest even more in that. Finally (and I'm so sorry this has turned into a long comment), I'd like to suggest making some changes to specific cards. Lay Bare isn't doing you any favors. Run literally anything else...okay not Fold into AEther, but other better counterspells. Contagion Clasp, Contagion Engine, Titan Forge and Lux Cannon just seem to be reasons for others to attack you. 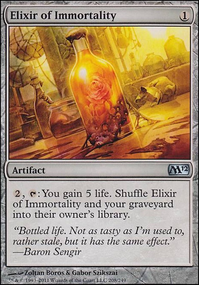 As they don't help the overall theme of the deck, I'd look to more relevant artifacts like Rings of Brighthearth, Eternity Vessel, Metallic Mimic, Brass Herald, or Door of Destinies. You've got a very well-designed deck here, in my opinion. And if I end up building Moonfolk, your list is where I'll start. Thanks for putting up with my long comment. Enlightened Maniac gives you a 3/2 token when it enters plus gives you a creature you can willingly throw in front of an attacker. Master Splicer creatures a 3/3 token that he buffs to 4/4 and Temmet will then buff to 5/5, so pretty good. Also if you have him out, Titan Forge will pop out 10/10 golems. Battlegrace Angel and Celestial Mantle are both great supports for your attacking token for life gain, and Battlegrace Angel also gives you an exalted trigger.